← A conVerse: Know Difference between Shiva and Shakti ! Lord Ardhanarishwara, epitome of oneness of Lord Shiva and Shridevi ! Benefits: Successful accomplishment of all objectives; All prosperity; Overcoming all obstacles. Meaning: Joined with Shakti(thyself), Lord Shiva is capable of creating the Universe. Otherwise, the Lord is not be able even to stir. You are worthy of being adored even by Lord Vishnu, Lord Shiva and Lord Brahma. Therefore, O Goddess! without acquiring great merits, how can a person be able to salute you? Exposition: What a great statement of reality! This is the most important opening shloka of Soundarya Lahari. It declares that Shiva and Shakti are one and have to be always together to do anything. They are the parents of the world as prayed in Vagarthaviva Shloka of great poet Kalidasa. Shridevi is the primordial universal power beyond Hindu Trinity viz., Brahma-Vishnu-Shiva. Since great divine powers worship her, normal human beings like us should have accumulated great merits to pray her. In other words, it is our great fortune to be a devotee of Shridevi. So, we are really blessed to discuss the glory of Shridevi. Oneness of Shiva and Shakti: Only with united with Shakti(Shridevi), Lord Shiva can create the Universe. 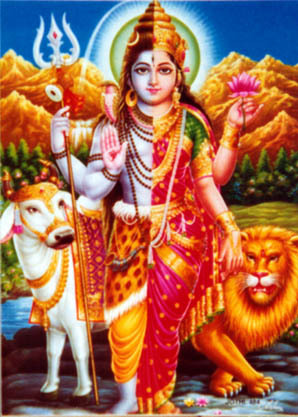 This means that Shiva and Parvati are the parents of the world and are always together. Mystical Diagram, Shrichakra: The mystical diagram Shrichakra represents Shridevi and also the entire universe. Five Shakti triangles and four Shiva triangles together form the crucial part in Shrichakra. So, without Shakti and Shiva triangles, the Shrichakra cannot be constructed! Creation Process: Shiva and Shakti represent Purusha and Prakriti which are male and female aspects respectively. According to Samkhya theory, union of Purusha and Prakriti leads to the creation of the universe. So, again it proves that the Lord Shiva and Shridevi are the divine parents of the world. World of Words: According to Tantras, vowels and consonants of Sanskrit alphabet represent the powers of Shakti and Shiva respectively. Only by combining these two, we can create the word. Without combining vowels and consonants, a word cannot be uttered. So, Lord Shiva and Shridevi are intricately connected in each and every word. As discussed earlier, the world comes to existence just by words. Shakti in word Shiva: The vowel “i” (i is pronounced as in “kit”) is the critical vowel for the word Shiva. It represents Shaki. It gives energy to the word Shiva. Only united with i, the word Shiva represents Lord Shiva and gets his energy(Shakti) to create the world. Shiva and Spanda Principle of Tantras: According to our Scriptures Tantras, Lord Shiva is the static part of the Universal Self. Shakti is the dynamic portion who manifests herself as spanda(pulsating energy). This is implied by the word spanditumapi (to even stir). In other words, Lord Shiva is the power holder and Shridevi is his Shakti(power). Kundalini Yoga: Shiva means every one of us as Individual Self. Here is the arrangement of words(anvaya): Shivah yadi Shaktya yuktah (syat), tarhi prabhavitum shaktah bhavati. Only by being united with awakened Mother Kundalini Shakti, one will be able to evolve spiritually. Nachet evam devo na khalu kushalah spanditumapi. Otherwise, we cannot even move a bit in the spiritual path. In Kundalini Yoga, awakened Mother Kundalini makes the real yoga happen to the practitioner. This suggests that the Kundalini Yoga to be one of the essential means for spiritual evolution. Guru’s Grace and Siddha Yoga: Shiva means every one of us as Individual Self. The arrangement of words is same as earlier, as in #7. But, the meaning is different! Only by uniting with Sadguru‘s Shakti(Grace of the Guru), we can evolve spiritually. Otherwise, we cannot even move to make any progress on the spiritual path because of ignorance. The word prabhava is to be interpreted as evolution. The Grace of the Guru eliminates our ignorance to help us identify and realize the Universal Self within ourselves. So, this shloka mandates the necessity of a Guru for spiritual realization. In Siddha Yoga(a form of Kundalini Yoga), a Sadguru(Realized Master) transmits the kind Grace to a worthy disciple via Shaktipat to awaken the divine Mother Kundalini. Awakened Mother Kundalini brings about the real yoga to the disciple. Sadguru and his power: In this perspective, Shiva means Realized Master(Sadguru). Arrangement of words is same as in meaning #7. Only by uniting with Sridevi’s power, i.e. Shakti, Sadguru is able to become source of Grace to awaken Mother Kundalini. Otherwise, Sadguru will not be able to move Mother Kundalini by Shaktipat. How do we get this meaning? Let us understand it clearly. The word prabhava is to be interpreted as source of Grace. The word spanditumapi has to be taken as Shri Kundalini Deveem spanditumapi which means “to move the Mother Kundalini “ by Shaktipat. The moment Kundalini Devi gets awakened by Shaktipat, she starts moving towards Sahasrara to meet her Lord, Shiva. As we know, by definition, Shaktipat means the descent of Shakti(Shridevi’s power) from Sadguru to the disciple to awaken Mother Kundalini. Words of Beauty: True to its meaning, Soundarya Lahari(Wave of Beauty), the words used in shlokas are also beautiful so as to provide a wonderful rhythm, tone and melody to the waves! Have a look at these pairs of almost rhyming and homo-phonic words: Sha-ktya, yu-kto, bhavati, pra-bhavitum; devam, devo; pranan-tum, sto-tum. It is a wonder; feel it! So, what is the take home from this great verse? Let us pray that primordial power(Shridevi) always (for Her Grace!). Liked this article? You may explore other articles on Soundarya Lahari here. Read and enjoy! 1. Are you practicing any New Age Yoga without knowing any basics of real yoga? or Do you want to know the real meaning of the traditional yoga? or Are you a beginner thinking of joining a yoga course? If answer to any of the above question is yes, you need to check out the articles in The Pillars of Yoga. We are sure that you will thank yourself that you read these! 2. Would you like to know the core fundamentals of Raja Yoga(a.k.a Astanga Yoga) as taught by Great Master Maharishi Patanjali, free of charge !? Then, look no further! Read our series of articles of a free online course, The Essence of Raja Yoga here. Note: If you are a new guest to our website, we recommend you to read About, FAQ and Our Policy pages before proceeding further. It really helps to prepare yourself to understand the content in the right perspective. Enjoy reading! Have fun! This entry was posted in Oneness of Shiva and Shakti, Soundarya Lahari and tagged meaning of first sloka of soundarya lahari, meaning of soundarya lahari sloka 1, meaning of soundarya lahari slokas, oneness of shiva and shakti, shridevi and hindu trinity, soundarya lahari, soundarya lahari meaning, soundarya lahari shloka 1, soundarya lahari sloka 1. Bookmark the permalink. 4 Responses to Soundarya Lahari – Shloka #1: Essential Oneness of Shiva and Shakti! thanks for the very interesting explanation. when can we hope to get the remaining ones’? Due to our limitations elaborated earlier, we will be discussing only selected shlokas of Soundarya Lahari. As a mark of devotion and respect for Shridevi, we will be publishing them on Fridays/Tuesdays. Stay tuned!